LONGMEADOW, Massachusetts – Connecticut entered the final day of the 2018 New England Golf Association Junior Invitational owning a 17-stroke lead, but even a final push from the second place Massachusetts team wasn’t enough to overcome Mother Nature, as heavy downpours lasting nearly an hour led to the suspension of play and the eventual cancellation of Tuesday’s final round at Longmeadow Country Club. As a result, Monday’s 36-hole round scores were used to determine this year’s champion in both the team and individual standings. For the first time since 2012, the team from the Connecticut State Golf Association were crowned champions, finishing with a two-round score of 11-over 711 in the best five of seven scoring format. With the victory, Team Connecticut picked up their record 16th title since the tournament began in 1967. Led by medalist Ben James (Great River GC), who finished the 36-hole round at 2-under 138, Team Connecticut saw four of its five scorers place amongst the top-10 on the individual board, including tournament runner-up Chris Fosdick (CT PGA Junior Golf Association), T3 finisher Jackson Fretty (Greenwich CC) and T10 finisher Connor Belcastro (CSGA Club for Schools). Matthew Doyle, of Madison Country Club, placed 14 at 7-over 147 in two rounds to finalize the scores for the Constitution State squad. “It means a lot for me. This is a big tournament for my teammates and I to win,” said James Tuesday afternoon following the cancellation of the third round that ultimately set up their victory before anyone other team could jump up and steal the top spot. After advancing to the U.S. 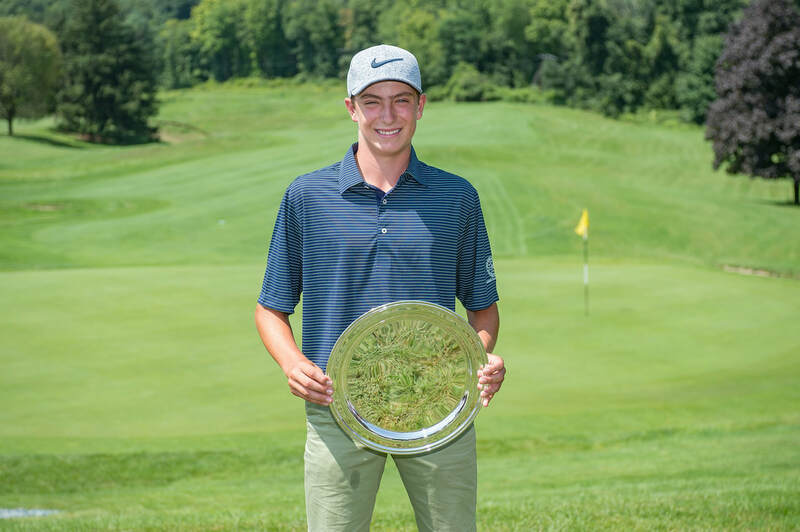 Junior Amateur Round of 32 and winning the Northern Junior, the Hampden Hall Country Day School freshman James said this victory stands out because of the top-talent that he had to face from each of the six New England states to come out on top. Behind Connecticut on the leaderboard, Team Massachusetts placed second at 28-over 728, six strokes ahead of third place Vermont. The Bay State squad, led by an afternoon charge from Jack Tobin (Marlborough CC) and his 2-under 68 performance that saw him place T3 overall. New Hampshire’s Sam Barton (5), Rhode Island’s Colin Sutyla (T6) and Sam Taraian (T10) and the trio of Vermont golfers in Logan Broyles, Bryson Richards and Jared Nelson finished out the top-10 scorers.